In any case, the glove does lend itself to a variety of DIY applications—working around breaker boxes with the power off, changing a tire on a lonely road, working in a cramped, dark cabinet, tracking wild critters in the dark. There are some other applications I came up with that weren’t on the website, but which would still be extremely useful, such as searching for the last bottle of beer around the fire pit, or as a dog-bomb locator, for strategic cleanup when walking our large dogs in the dark. The glove comes in medium, large, and overglove (to fit—you guessed it—over a glove!) sizes. I received the large size; I have large hands, and the stretchy neoprene fit snugly, but not uncomfortably, over my thumb and index finger. 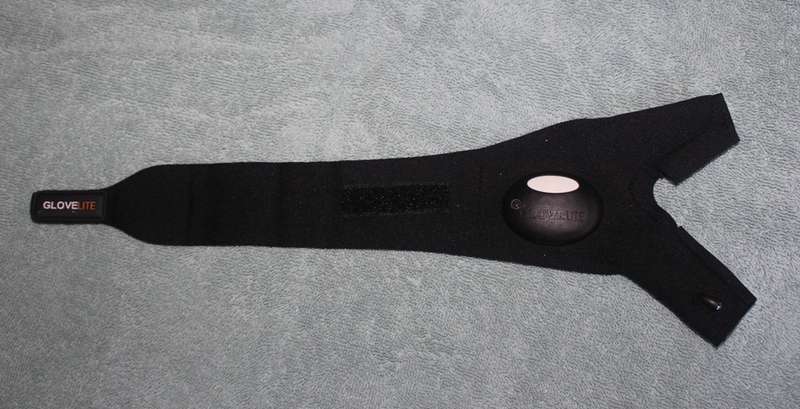 The strap fit well around my wrist, and the little Velcro closure held it lovingly in place. My wife tried it on, too, but she has itty bitty girl hands, and the glove was way too big for her. The glove features dual 5,000 mcd LEDs (mcd stands for millicandela, the unit of measurement for the brightness of LEDs; if you’re having trouble sleeping, and want something to numb your brain, Google it and settle in…). I fired that sucker up, gathered up my courage, and peered cautiously into the dark, scary recesses under our bed. It illuminated the dust bunnies nicely, and left me yearning for more adventurous uses. Plenty of light, right at your finger (and thumb) tips. So I pretended there was a cloud in the sky, and our power had gone out (which is normally about all it takes). I used the illumination from the GloveLite to go down the stairs into the darkened basement, and found my way to the breaker box to check it. (Actually, our usual procedure is to look out the window at the neighbor’s house to see if THEIR power is out, and then to rustle up our supply of kerosene lamps and candles and get them lit. This would be much easier to accomplish with the GloveLite than juggling a flashlight). The light put out by the glove made getting down the stairs and through our (moderately cluttered) basement no problem. The GloveLite is waterproof, too, in case you’re required (or inclined) to perform your repairs (or doggie duty) in the rain. Or in case you drop your cell phone in the toilet, down a sewer, or into a swimming pool at night (all three of which have been accomplished by one of my daughters—the Verizon underwater trifecta!). Since the weather gods were uncooperative, and my daughter lives out of town, I used my Simulated Rain Chamber (aka kitchen sink) to test this feature, and despite a steady soaking, there was nary a flicker. As someone who has spent a fair amount of time in dark, often uncomfortable places, with a flashlight A) stuck in my mouth B) tucked under my arm or C) propped up against something that it inevitably falls of off as soon as I start working, the idea of a “flashlight you can’t drop” is very appealing. 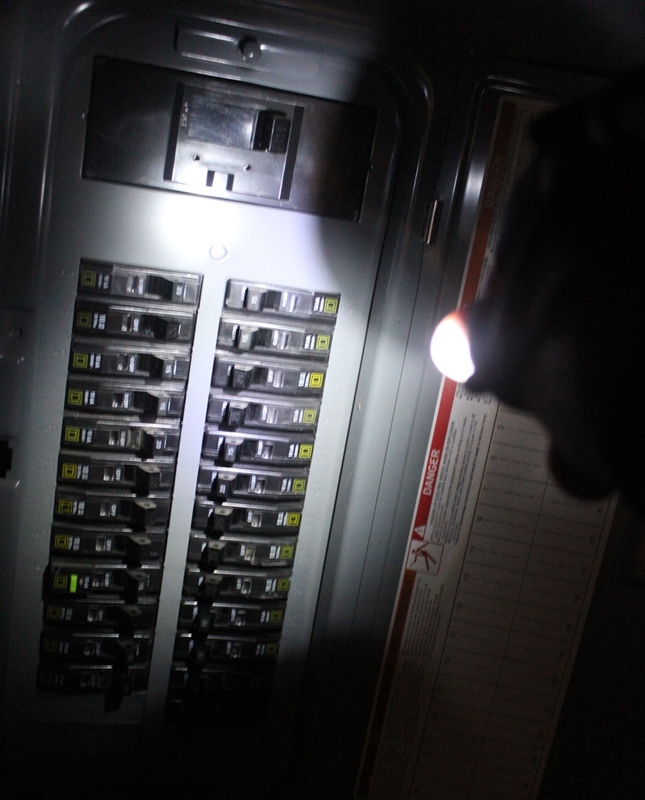 The GloveLite seems to be a well-made product, and would be a useful addition to the toolbox for any electrician, plumber, mechanic, HVAC worker, or for ANY one who has a task to accomplish in the dark, and wants an extra hand free. 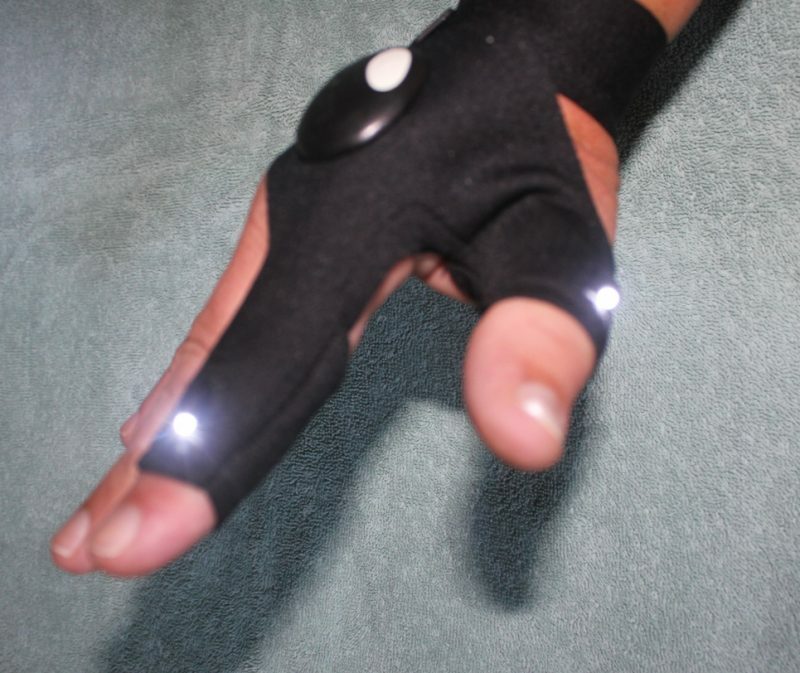 If you want one, moon-walk your way to Amazon, where you can find the GloveLite for around $20. Strap it on and light up your world! Don’t bother, this thing is a cheap piece of trash. Battery compartment is impossible to open & even harder to close; even then the batteries don’t align & therefore the lights won’t work. Save yourself the $25 ($6 for shipping, which only costs them 85 cents) If there were a -5 review, this deserves it. Would it be better on your dominant hand or non-dominant hand? It is made to use on your dominant hand, becuase the light will shine right at your point of work. 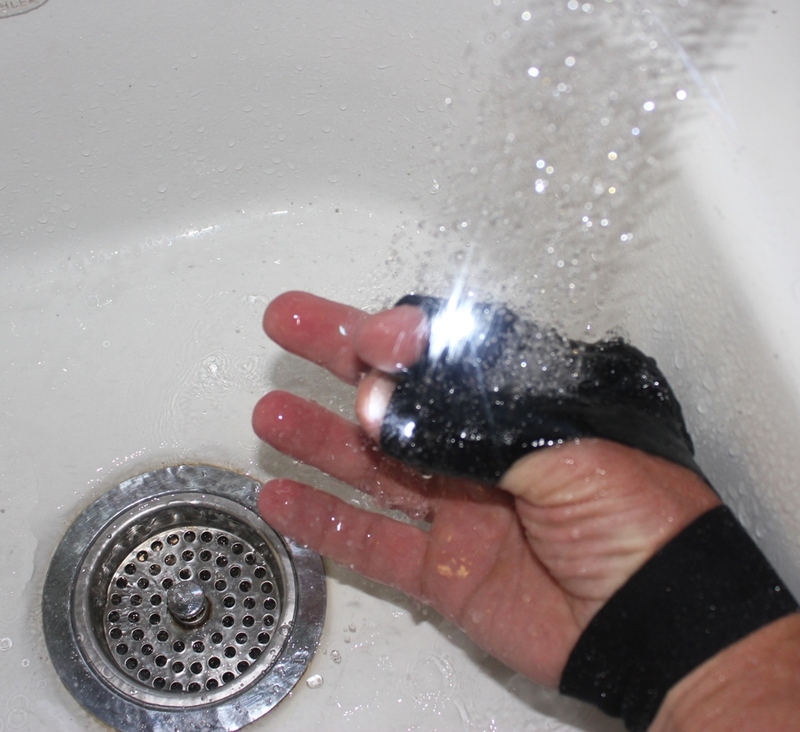 However, if you wear them on BOTH hands you can have even a wider range of light!